A Large Size, Thin, Colorful, Visibly Aged, Well Made Madison Point That Exhibits Surface Oxidation Aging And Stone Coloration Patination, Surface Aged Stone Pore Surface Deposits, Correct Style Blade Flaking, Correct Straight, Thinned Base And Overall Shape, Visible Surface Patination, Correct Material And Manufacture For The Area Found. Ex-Dennis Smith Collection. 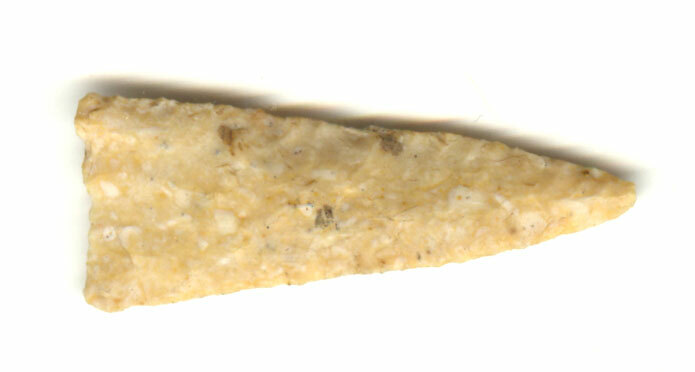 The Madison Is Believed To Be An Un-notched Cahokia Point. This Is A Nice Example, In Good Condition! Includes A Ken Partain Certificate Of Authenticity.